I was lucky enough to land a box of 12-13 Rookie Anthology today for $100 cash, as well as a three pack mini-box of the new Trilogy for exactly the same amount. Here are the results! Everything but the Lucic is available for trade, and will be added to the ORG some time tomorrow. Thanks for taking a moment to have a look! I think that with Trilogy, you have to go with the full box. There's always a weak mini-box and it seems that you got it. In my full box, one mini had the same hits as yours but the RC was Howden. With Huberdeau (Rookie of the year), you should getting back near the price of your mini box (in my opinion, it should reach 60$-70$). You're right about not being the biggest names but it's often the case with 2012-13 products. I would say that the Trilogy was decent to you, Chris. The Huberdeau is a nice hit... but he IS a Panther. As for the Rookie Anthology... I like that break myself! I can use that Robert Mayer, so if you want to hold on to it, I will be back into the trading game in a little over a week. Congrats! 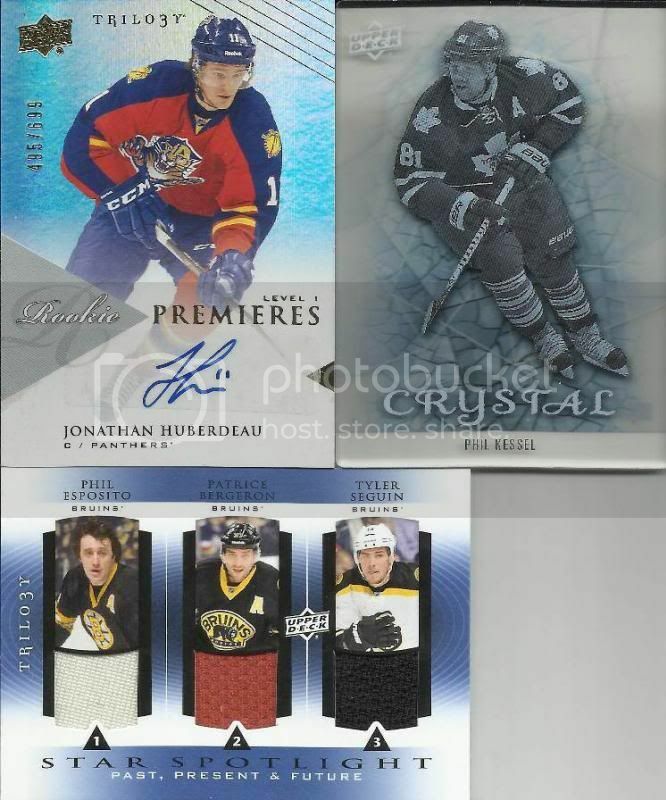 I'd be pretty happy if I bought one pack of Trilogy and landed that Huberdeau. the Boston card is nice as well. Anthology seems to offer a reasonable cost per card. I liked the multi-coloured swatches/patches. But wow, Trilogy is like a black hole...the Huberdeau saved it (a bit) but I won't be touching the stuff.